It’s time for a bit of catch up on my Elephant Parade QAL blocks! Once again I asked my husband to help me pick out the fabrics for the turtle block. He was in a mood to represent a box turtle, and the brown fabric with swirls really captures the turtle shell texture quite well! Working on this cute turtle block brought back many memories of snorkeling off the coast of Maui and Oahu with my husband and green sea turtles. My husband has been working to refine his underwater photography, and I just love how he captured the moment just prior to a deep dive of this green sea turtle in Maui! The bird blocks are bright and fun! I used Kona Lipstick and Kona Citrus for the birds, and I just stitched yellow thread legs for the birds. I think it will all smooth out in the final piecing, quilting, and wash, so it’s good enough for me right now. I have some fond memories of a cardinal couple that lived near our home in Virginia. The bright red male cardinal was very dedicated to his mate. She had some kind of accident and had injured a leg; she could barely support herself to be upright. He would come to our bird feeder and take her back some tasty morsels on whatever perch she could prop herself. Over the course of a week, his care allowed her to nurse her leg back into shape. Thankfully it was something that healed; and I just love the memory of how carefully he would select what seed to take back to feed her. The flower blocks were a bit more tricky; there were a few cut typos in the pattern I was following for the red flower, but after a quick adjustment or two, they came together just fine. For anyone who is interested, it took me 30 minutes to make the turtle block, 35 minutes to make the bird blocks, and 1 hour 15 minutes to make the flower blocks. I really love paper piecing when pre-cut information is given for the pattern! Yanick had great instructions and offered a delightful opportunity to play with the bright colors in my stash. One thing I noticed is that my most of my bright, fun prints have flowers in them, or a lot of my fun prints are darker gray or really light colors. So that left me with my bright geometric prints and the fun owl print. I think it is awesome to get such fast and immediate feedback on fabric selection through Instagram. The question for this month is if we have a favorite fabric line and/or designer? I love Carolyn Friedlander’s fabric designs and I love Kona solids. Linking up to Main Crush Monday and Monday Makers (buttons to the right). 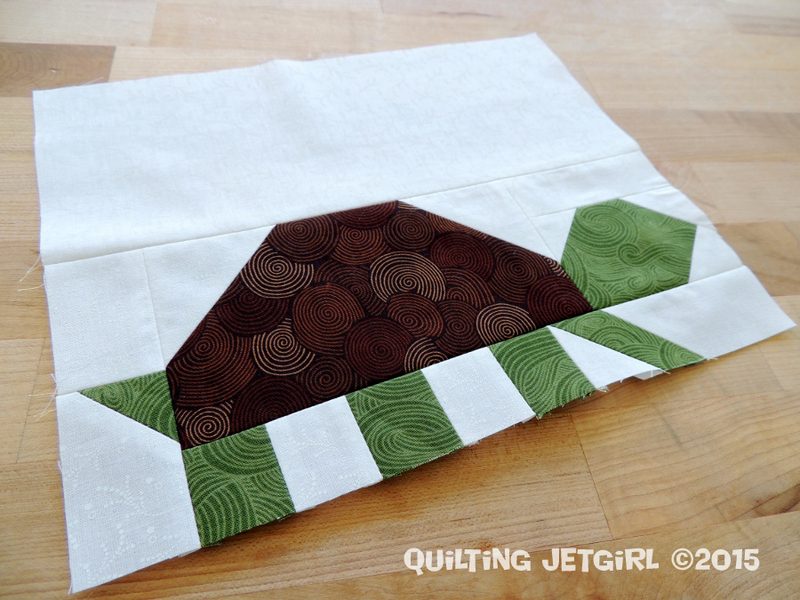 Love that box turtle block, Yvonne. He is rich! Sure enjoyed reading about your bird friends from Virginia. 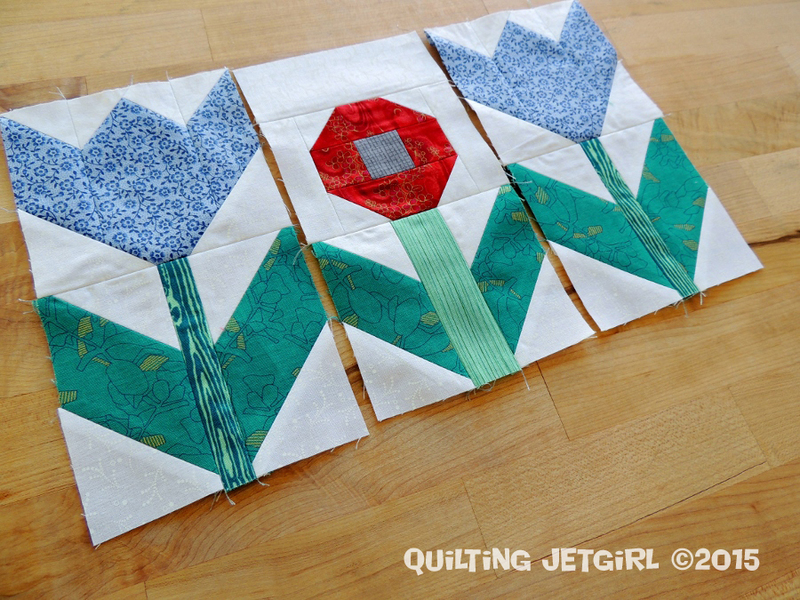 And your flower blocks look fabulous! If there was a cutting typo could you please send me an email with the details so I can correct the instructions you were following. Sure would appreciate that. Your bee blocks are bright and beautiful, too! Have to say I can’t argue with your choices for fave fabric lines. Great choices! I really love your (and your husband’s) turtle fabric choices, they work brilliantly. And the photography was amazing as ever too. Wow! Your husband’s underwater photgraphy is amazing, and those swirls in the turtle work really well! 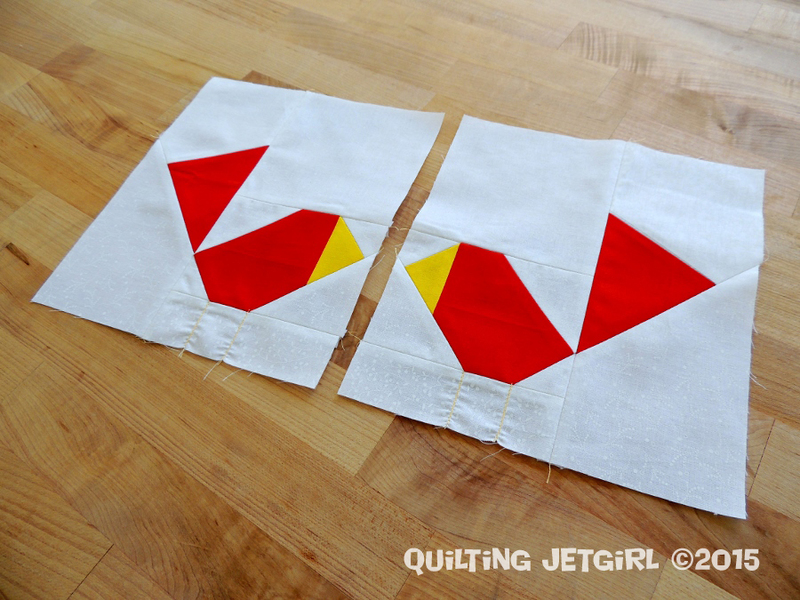 I love paper piecing economy blocks – the precision just can’tbe beat. Sometimes a little iron on stabalizer can help when thread sketching bird legs. We used a ton of that in the penny sampler class for bird embrllishments and vine stems. All your blocks look beautiful! All of your blocks are so dang cute! Love the story of the birds, hubby and I have so much fun watching all the birds that come to our feeders. Looks like you’re having fun with Lorna’s Elephants on Parade! Your husband’s turtle photo is stunning – a great combo of vision, technical excellence, and right place/right time. He must be very talented. Like you, I’m drawn to the simple clean geometrics and low volume prints in Carolyn Friedlander’s Architextures and Doe lines. I see you enjoy the Elephant Quilt parade as much as I do. You used such a beautiful fabrics and colors. Love to see your elephant parade quilted and finished. I really like your fabric choices for the Elephant’s Parade blocks. 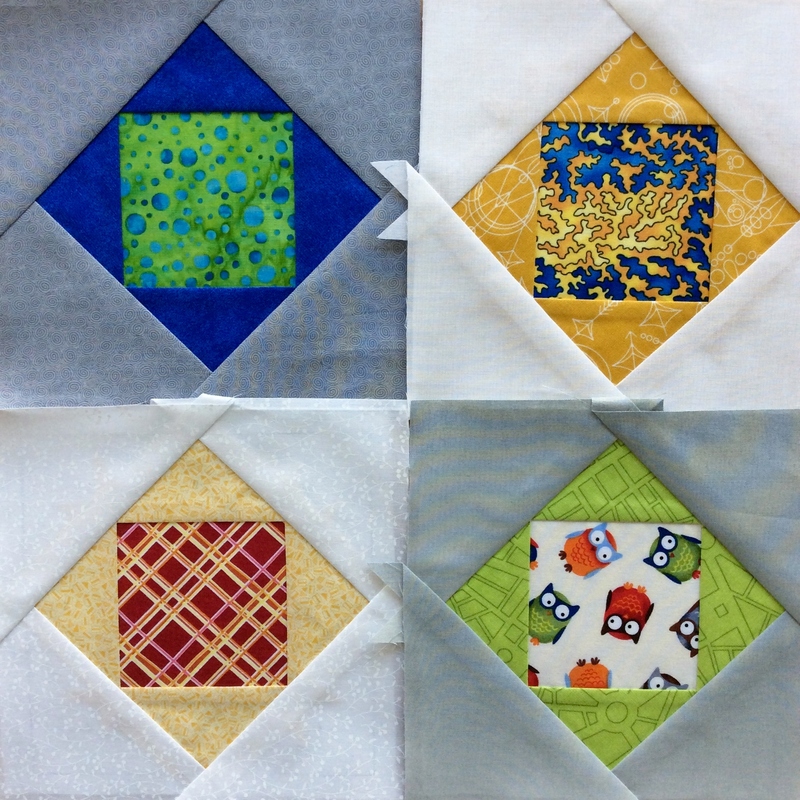 Bee blocks look good too – it really makes you look at your stash with new eyes, doesn’t it? Your husband picked a very nice turtle! I like your stash Bee blocks. That mercury sun print and the batik bubbles are beautiful! What a sweet story about the cardinal! I love backyard birds and the effort of keeping a feeder filled rarely goes unappreciated! You have been busy! That turtle is my favorite block shown. Your hubby has good taste. I think I like Art Gallery and Liberty fabrics for their feel, but all for the pretty patterns! The more I see of your elephant quilt-along, the more I see myself making an elephant humidicrib quilt. Maybe I need to ask your husband to help me choose fabrics! Oh I love your turtle! What a perfect fabrics! You really did play a lot of catch up! I need to be doing that myself, including my elephants! Ack! I’m finishing up birthday quilts right now that are due Saturday (talk about cutting it close). I never thought of having a Paper pieced pattern giving precut measurements, that would be really neat. Sometimes working with odd shapes really does make the process a bit harder as there is ”too much” selection! My brain goes on overload! My favorite of these is the turtle as I think the fabrics did fit it so well that it looks actually like the actual shell. Both you and your husband have a great eye!